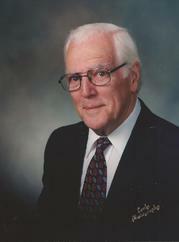 John M. Drescher, 85, passed away on Thursday, July 10 in his home. John was a well-known author, teacher, and pastor in the Mennonite community. He wrote 37 books, pastored a number of Mennonite churches, and served as editor of a church magazine and as a counselor at Quakertown Christian School. John was married to Betty and a member of Finland Mennonite Church. I just received word Friday that my friend and mentor John Drescher had died early the previous morning. But John, with his good wife Betty, came close, and yes, always as a part of a committed congregation. I grew to deeply appreciate him during the several years he was a member of the Zion Mennonite Church (in Broadway, Virginia) where I served as pastor for two decades. And Betty was her own special kind of woman—warm, hospitable and never complaining. She did a lot of the typing and proofreading of John’s manuscripts, and he clearly could never have accomplished what he did without her. With John being the gifted and acclaimed preacher, writer, and editor that he was, I could easily have found it intimidating having him and Betty in the congregation. He was both older and far more experienced that I, having served as a pastor in three congregations, bishop or overseer in three conferences, a one-term moderator of the Mennonite Church in North America, the editor of Gospel Herald, and as a college pastor and seminary teacher at Eastern Mennonite University. But he was always a most loyal and supportive member of our congregation, frequently writing me an affirming note or otherwise taking the time to encourage me. John was almost surely the most prolific and widely-read Mennonite author ever, having had 37 books and countless articles published, as well as serving as editor of the Gospel Herald (now The Mennonite) for twelve of its most successful years. One book, Seven Things Children Need, sold over 125,000 copies and was translated into over a dozen languages. Spirit Fruit also went through several printings and was read by thousands, as was his book Why I am a Conscientious Objector. And in addition to all of his work as an author, Drescher wrote scores of articles published in over a hundred magazines, including Christianity Today, Reader’s Digest, and Catholic Digest, and I’m told these have been translated into in at least seventy languages. Can any other Mennonite writer seriously compete with that? But I will always remember John not just for his greatness, but for his genuineness as a good man of God and a servant of the church. We owe him and his Lord a large debt of gratitude. John M. Drescher was an ordained leader in Franconia Mennonite Conference. He was the loving husband of Betty Keener Drescher. He is survived by his wife and children, Ron (Inez) of Monterey, Tennessee; Sandy (John) Drescher-Lehman of Green Lane; Rose (Rich) Longacre of Quakertown; Joe (Janice) of Middletown, Connecticut; David (Rhonda) of Morrisville, North Carolina; 14 grandchildren, nine great-grandchildren; his brother, Luke (June) of Harrisonburg, Virginia; and his sister, Ruth (James) Glick of Kidron, Ohio. John was a member of Finland Mennonite Church. A memorial service will be held on Saturday, July 26 at 3:30 p.m. at Franconia Mennonite Church (Telford, Pennsylvania). Calling hours will be Friday, July 25 from 6-8 p.m. and Saturday from 1-3 p.m. Memorial contributions in John’s name may be sent to Quakertown Christian School, 50 E. Paletown Rd., Quakertown, PA 18951 or to Finland Mennonite Church, 1750 Ziegler Rd., Pennsburg, PA 18073.